The biggest and fourthiest addition to this storied party game franchise features the blanking fun sequel Fibbage 3 and its new game mode, Fibbage: Enough About You; the web-based frame game Survive the Internet; the spooky date-a-thon Monster Seeking Monster; the deranged debate match Bracketeering; and the one-up art game Civic Doodle. Use your phones or tablets as controllers and play with up to 16 players, plus an audience of up to 10,000! The web-based frame game Survive the Internet (3-8 players). Twist your friends’ “online” comments in hilarious ways. 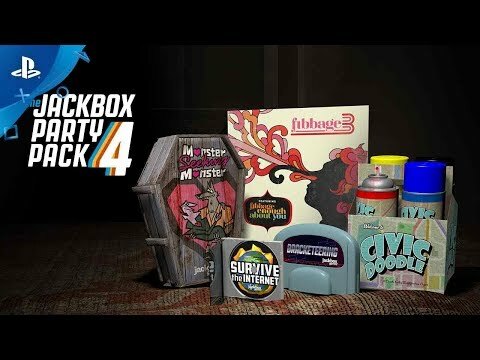 See The Jackbox Party Pack 4 in Action! Created & Developed by Jackbox Games, Inc. Game and Software © 2017 Jackbox Games, Inc. All rights reserved. Jackbox Games, Fibbage, and the Jackbox Games logo are registered trademarks of Jackbox Games, Inc. Survive the Internet, Monster Seeking Monster, Bracketeering, Civic Doodle, and Party Pack are trademarks of Jackbox Games, Inc. All other trademarks and logos are the property of their respective owners.